The new morning and the beginning of the new adventure. The sun wakes us up in the early morning. Lying on the floor in the living room of Nora’s parents. At this moment we realize, that today we will leave their home. We will leave the Netherlands and we are not coming back within the next nine to ten months. It is the shift from the daily life at one place to the daily life on the road. The adventure life We left our jobs, our house our daily life. The morning hours are slow, somehow, like we are afraid to do the step into the next chapter of this life. In the early afternoon the engines are starting and being followed by Nora’s parents for a few kilometers, we wave goodbye and we wave good bye to the Netherlands. Leaving this place in the beautiful month of August 2018. Cape to Cape is the plan. Taking advantage of the last two months of summer in Europe to explore the wilderness of Scandinavia on a motorcycle and to visit my family in Vienna, before we head south to cross into the unknown continent. Africa. Germany is this time more a country to cross to get to the ferry to Sweden as soon as possible. A heavy thunderstorm is surprising us in the night before we depart from Friedrichshafen. Riding through the storm we can reach a safe campsite in the darkness. The ferry takes us to the most southern-east point of Sweden. This is where everything starts. We explore the country by the gravel roads, leading us through tiny villages, forests and farms. A total new experience about travelling through Europe! On one of the trails something special jumped into my sight and with waving hands I signal Nora to stop at the spot for a minute. Special thanks at this point to the TET community and its linesmen for providing all the gpx.-files for those trails. Picturesque landscapes. Endless fields. Almost no people around. We enjoy the silence of wild-camping and visit an old friend of Nora, Alice, who is running a farm since last year in the area of Falkenberg, close to Gothenburg. It’s a farm you would imagine out of a story of Pippi - Langstrumpf. Red wooden facade houses with white window frames and the sound of horses coming from the stables. We use two days at that place to arrange ourselves and to optimize our travel gear and electronics. With reaching Scandinavia we can feel the first cold nights and after a long hot and dry summer, the rain has found its way back to Europe, starting in the north. Until this time we have never ever thought about the precise route and about our time planning. Starting to look closer into it, we just realized how massively huge Norway is and the distance and time we have to cover to reach the North Cape. Its about 5000km from where we started in the Netherlands! That’s the distance from Austria to the border of Pakistan! Unfortunately that leads us to the decision, to skip the southern part of Norway and to ride straight to Alesund and further up north. The days are getting colder and the rain finds its way into the country. In the middle of August, we get aware of the fact, that the summer is over for us. The temperatures are around 10C. We reach the foot of the Trollstigen. The spectacular scenery and landscapes. Reaching the top of the mountain, we get the great idea to pitch our tent for the night. Waking up in the wet green rocky surroundings and taking a cold morning dip in one of the rivers up there. Norway is for us mostly about the beautiful landscapes and the curvy roads. 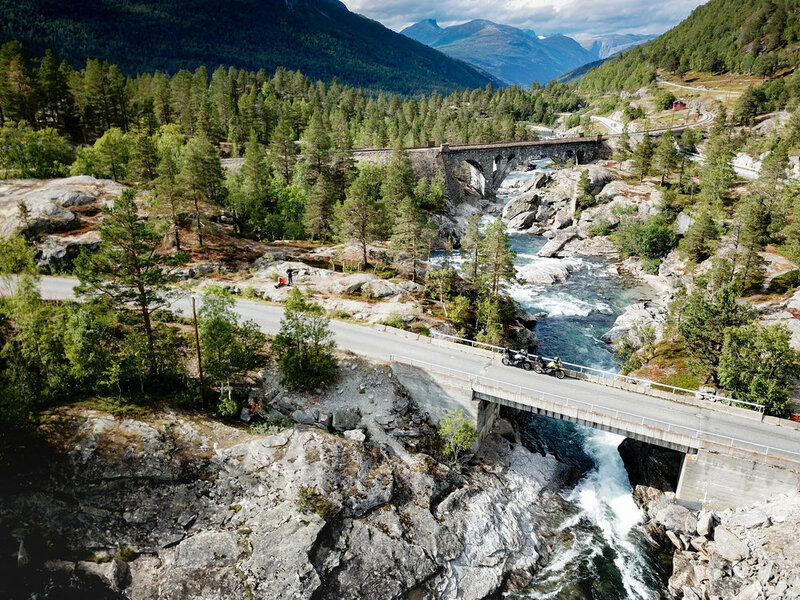 The descent after the Trollstigen is a 70km long windy road through mountains and strawberry fields, ending in the beautiful town of Vallal. In front of a large Fjord, where the ferry to the famous Geiranger Fjord departs. We don’t take the ferry, because we had an appointment. Since Nora started her Youtube-Channel back in the year 2016 she had a follower from Norway and this delightful couple of Rune & Anita was inviting us to their home close to the town of Alesund. They showed us around the area, told us stories about the culture of Norway and served us delicious food. It is super funny, since Rune & Anita know all of the adventures that are published on the internet, and to experience their relationship with the Youtube-Nora and now meeting her in person. I mean, that’s like you watch the TV series Friends and all of a sudden Jennifer Aniston is sitting in your living room. Alesund has a nice little oldtown, that was rebuild and financed by the Germans in the beginning of the 20th century after it burned down completely a huge fire. Standing on the top of the mountain and getting to know how complex this land is and the difficulty to connect all the towns over all those wide spread islands. They were building tunnel systems, to avoid disturbing the natural pictures with bridges. This is where I got to understand which possibilities the development of this country brings to itself. Norway is ranked as one of the most developed countries in the whole world at rank 2 and with the highest human development index in the world. The last night with our hosts gets to an end. We will continue further north the next day. Rune showed us the route alongside the Hegeland-coast. Checking the route we just realize again, it will take us almost 50 hours of riding time to get all the way to the north cape. Taking the long way up! Norway you are endless. The hard part about getting started in Norway these days are the continuous cloudy days. It seems like there are just rainy days in this country. The mix with the cold temperatures just turns the rides into missions. Into a testing period for our gear, that luckily keeps us dry. Finding camp spots always takes some time and it will almost always be rewarded with nice views if you keep looking. The spot was so astonishing with the light of the sunset, that it was time to start the drone for some epic aerial shots. It was pretty epic and it got even better. The drone lost the connection and the software decided to turn back to the GPS point where it started. Well, it maneuvered backwards just to realize via its sensors, that there is a mountain top full of trees. On the screen the drone turns around through the green of the trees until it lands softly on the ground. So.... The pasta has to wait. The sunset is almost done. 500m as the crow flies. We were hiking up a steep hill and try to find the drone in the woods. The dusk is making it hard to see and just with tone signals we are able to find the drone again, after an one hour search mission. Well, a deserved food tastes always better! Well getting more north we are invited in Orkanger, next to Trondheim. After dinner and a good rest our longest stretch of eight hours riding through rain is taking us to the first Island in Bronnosund. Finding an island to stay! Riding for more than seven hours through the rain we reach a small fisher farm with a green grass field where we are pitching the tent. Luckily there is a cabin with a kitchen which is becoming our shelter during the day for the next two days, since it is just raining the whole time and we feel the need to recharge our batteries. Sometimes it feels like it will never get better and we felt already tired and got paralyzed by all this cold and rainy weather. Keeping a positive mindset is the key to still have amazing experiences in such a bad time. In an hour of no raindrop falling from the cloudy sky, we jumped on our bikes and rode an hour to the north and back to reach the island that is located in front of the coast we are camping at. The mountain of Torghatten is there. We are experiencing a magic late afternoon, walking along the trekking route and the weather produced amazing colors all over the view there. It was amazing! The time has come to continue towards the Lofoten. We are already since 10 days in this country, and rode almost daily. Still it is endless. From now on our trip of endless amounts of ferries is starting and finally. No other possibility than to start while it is raining. It is just a relief as we can see the clouds vanishing and the blue sky is appearing with warm sunrays reaching our faces. Riding along the highway 17 takes a lot of patience. The distance between the ferries is not more than one hour of riding. Followed sometimes by a waiting time of up to 2 hours for the ferry to arrive. We found our way to take it easy and to enjoy sitting at the docks, making coffee, cooking food and talking to each other. By boat, we cross the arctic circle. This is a moment that gets announced by the captain of the boat. Reaching land we don’t have to go far to find a small gravel road leading away from the highway right to an old truck wreck in front of a bay. We are just surrounded by mountains and not a single human soul! Of course we pitch the tent at this spot and enjoy the night and sunny morning. Its slow. Ferry after Ferry. We finally reach the last stage! The road to Bodo scratches at one of the largest glaciers of Scandinavia. Actually the second largest. Its name is Svartisen am 370km2 large glacier, and alongside the road we captured a great picture of one of its glacier tounges. Reaching the city of Bodo, we find ourselves in a busy city for the first time after two weeks. Our senses are overwhelmed and we catch the three hour ferry to the Lofoten. 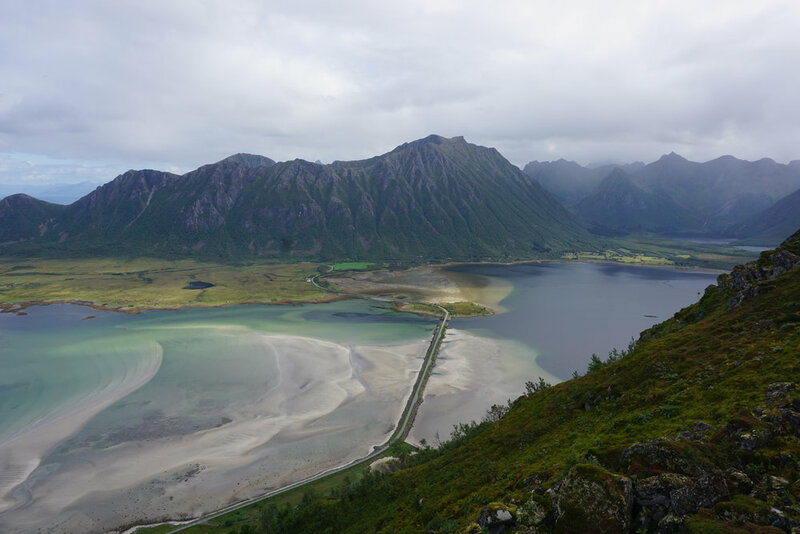 The Lofoten are providing a mountainous and harsh landscape with hidden white sandy beaches, amazing views and tiny pictures fisher villages. Well and it is fun to ride through the windy road with a motorcycle of course. One of our most impressive experiences was a one day long hike to the Matmora mountain top. A steep and short section that took us from zero to 550m above sea-level and traversing a long mountain ridge for another three hours, finding spectacular panoramas, we reach the top! Getting to know the fuel range of the Vstroms After a good night of rest we decide to take the last stretch of 1000km left to the North Cape in about three days. So from the Lofoten we want to reach the town of Alta. We are hitting the road and the fuel range shows that we have about 60kms left in our 20l tanks. Well we get a bit shocked after we realized on Google Maps, that the closest gas station is in a about 75 kilometers. Well let’s see if we can make it. Riding slower than usual we keep our fingers crossed. Nine kilometers left to the gas station. My fuel range meter shows zero. Well to get to the end. We made it to the pump! The Vstroms are incredible. 530kms on one 20l tank! That’s efficiency! The north of the north! The last night before we will reach the North Cape. Alta. On this campsite we see the first glimpse of a Aurora Borealis behind some clouds. A local is telling us about life in the darkness during the winter months. He says life is still normal and it is another world. The snow reflects the light of the moon and your vision gets used to the lack of light. The Snowmobile is the way of transportation. We have just seen the marked tracks through the woods which will be used for the Skidoos in the winter. I guess it must be fascinating to visit this part of the world in winter. Winds are predicted. Our new Norwegian friend from the campsite, who’s name i forgot unfortunately, told us that we should be careful. He said its going to be 10m/s. I think that is still manageable with the motorcycle. And off we go. There is just one road leading to the most northern point of the European continent. A 100km stretch along the coast and through windy high plains. The wind gets stronger and stronger. I even lost the phone bag that is patched onto the tank-bag because a gut blew it away. Luckily nothing was in there. On the horizon it occurs. It almost looks like an UFO. We pass the gates, pay the 25 Euros per Person (!!!!!! !####FFF####) and there we are. The great monument. The North Cape. The wind is blowing through our hair and we are happy. From now on we just go south, south, south! Cape to Cape! We have a little snack in the hall of the building. The wind just got stronger but we have to leave. Riding off we feel how strong the wind is and the gusts are unpredictable. Keeping it slow. Sometimes I get surprised after a hill where the wind gets channeled and blows with tremendous speed over the road, pushing the bike onto the other lane and I have to lean the bike in a crazy angle against the wind. Stopping at the supermarket in the first town after the North Cape Nora's bike gets even lifted over the side stand and falls on the side. It took us about two hours for the 100 kilometers back. The sunset starts and the wind is almost gone. We find a spot at the coast where we can stay for the night and the sky clears up. The moon is rising over the horizon and it is getting dark. We watch the stars as suddenly we see something strange on the sky. It is a white shimmer. Short but intense. Another one. We realize what we are about to witness. The northern lights. Two hours of a spectacular light show. Who would have thought that we get this as a present on our last night in the country of the thousand fjords. Norway. Thank you! Older PostHow to pack for a big adventure?